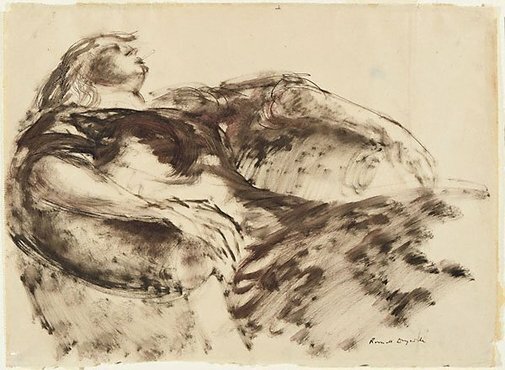 Russell Drysdale was a gifted draughtsman, and drew continually, developing his powers of observation and capturing his subjects in numerous variations. The 1940s saw his interests broaden to encompass aspects of Surrealism, as well as the work of Picasso, Modigliani and Henry Moore, which in turn informed Drysdale's renowned paintings of the Australian landscape; these works were to confirm his reputation as a major Australian artist. His work always remained centred on his sympathy for ordinary people and everyday experience. This drawing was made in 1941 or 1942 from memory. Drysdale had attended a party, and saw a woman leaning back into an armchair, a cigarette between her lips. 'I remember being struck with the pose and did think of painting it but never got round to it. I gave it to Sydney Ure Smith because he liked it so much' [as related to Daniel Thomas, AGNSW, by the artist]. Sydney Ure Smith (1887-1949) was an artist, publisher, collector and friend to many artists, including Drysdale. Signed l.r., pen and ink "Russell Drysdale". Not dated. Russell Drysdale: the drawings , Sydney, 2012, 58 (colour illus.). Australian present day art , Sydney, 1943, 34.